Most of the time, our family food options are simple. 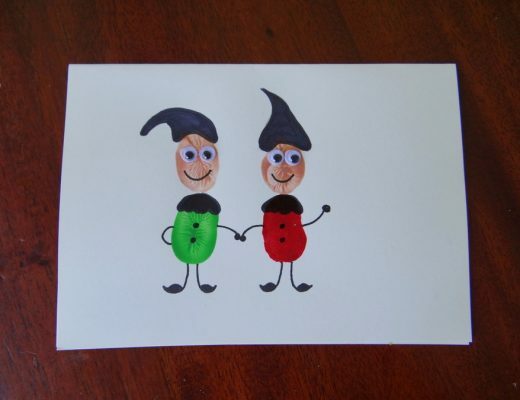 However, something I always remember about my own childhood was how my mother made an effort on holidays, mixing it up a bit to make things fun and special. 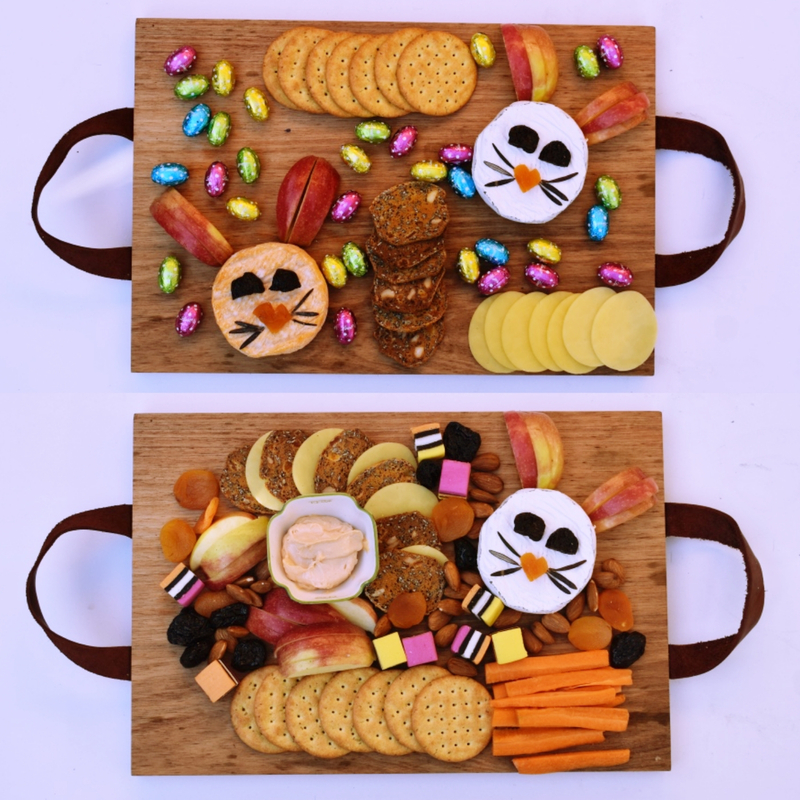 With the Easter holidays coming up, the BAFM team have come up with really easy kid-friendly platter ideas. 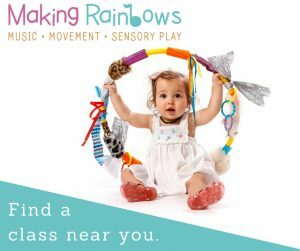 We wanted the ideas to be achievable and cute, plus, affordable too. 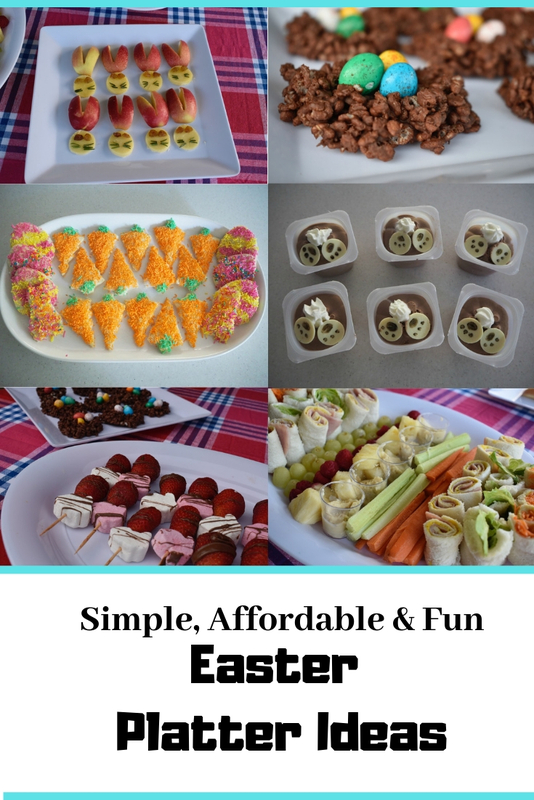 These food ideas are useful for Easter gatherings, or something a bit fun to do with the kids during the holidays. This was a HUGE hit at our place. You can find the full instructions over here. My children love the apple, cheese and sultanas combo. There is a nice balance between creamy and sweet. 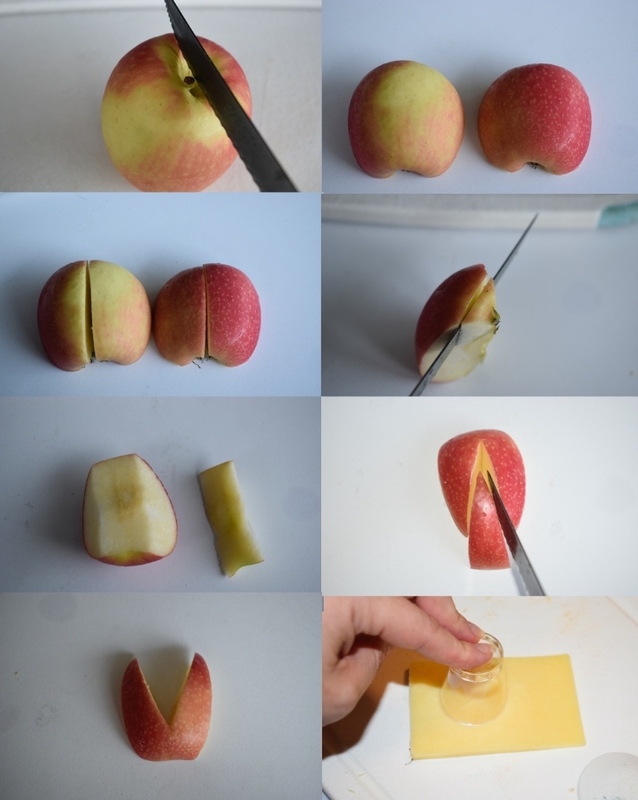 Cut an apple in half (top to bottom), and then in half again. Trim the core off each quarter to ensure the apple sits flat (skin side up). Either use cheese cubes for the head, or use a small circle shape (I used a shot glass) to create round cheese heads. Cut a sultana in half for the eyes, and if you want to include whiskers, use rosemary or can use edible markers (which you can get from the bakery aisle at Woolies). Tip: Use a little lemon juice on exposed parts of the apple to prevent browning. 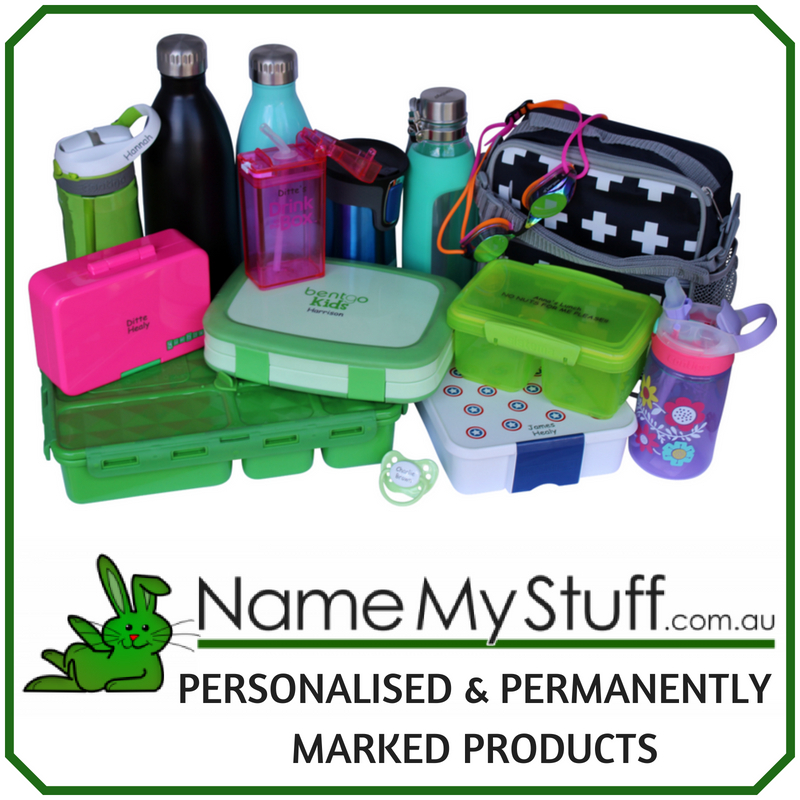 Note: The Easter buckets featured in the image above comes in four different colours and can be found instore and online here. 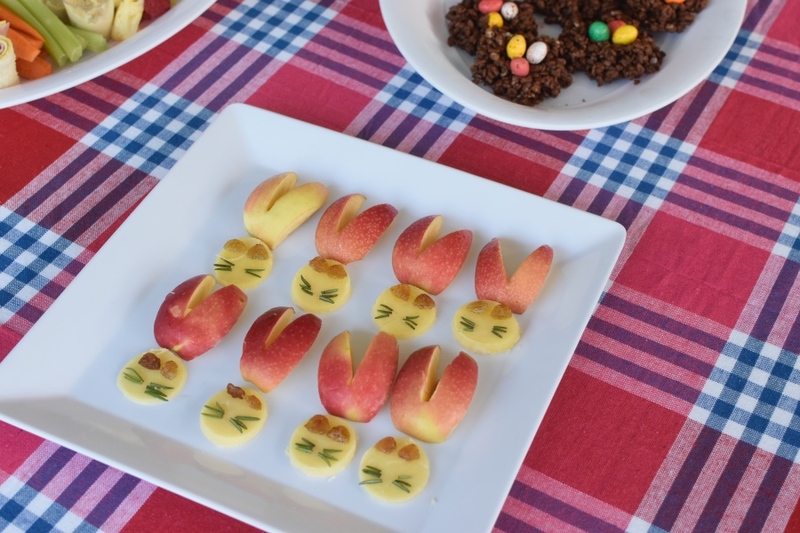 These are super easy to make and my kids LOVED them. Measure out 4 cups of cocoa puffs into a large bowl. Melt the chocolate in a glass or stainless steel bowl over a saucepan with a few cups of simmering water. 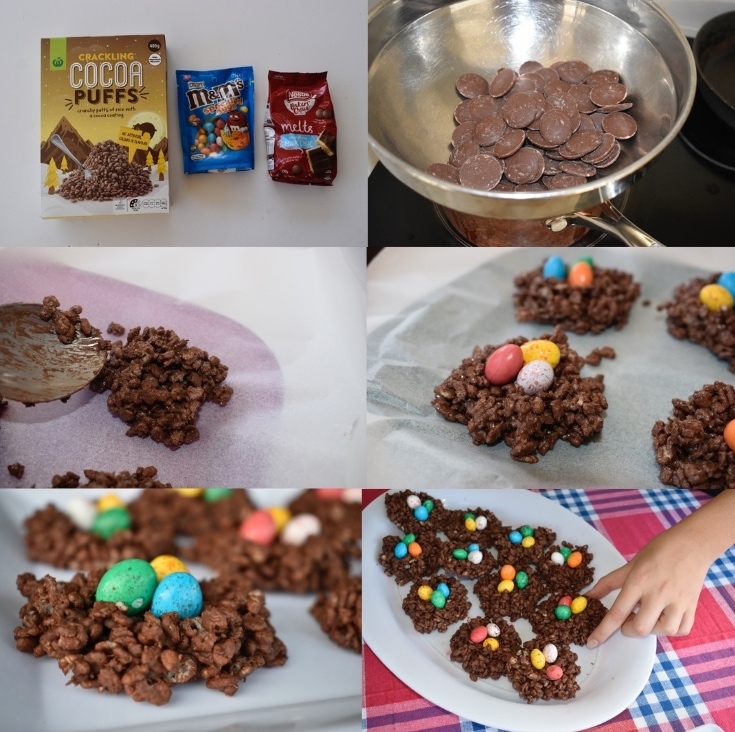 Pour the melted chocolate over the puffs and stir to combine. Line a tray with baking paper, and spoon the mixture into nests. Don’t worry at this point if you feel like they won’t hold together. Once they set, it will stick. Add three speckled eggs on the top. Set in the fridge for a few hours and they are done. They will keep refrigerated in an airtight container for a few days. 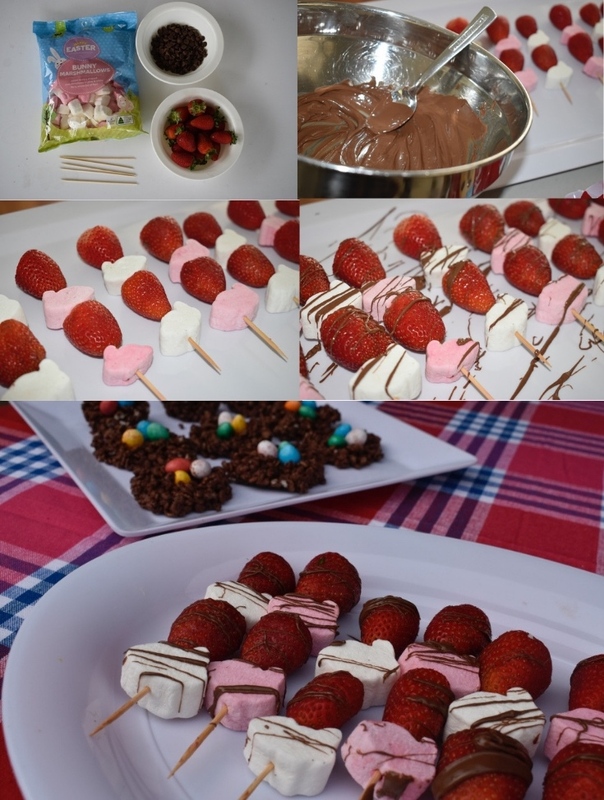 My daughter spotted Bunny Marshmallowswhen we were last Woolies and it was her idea that we make strawberry & marshmallow skewers. They turned out so well! 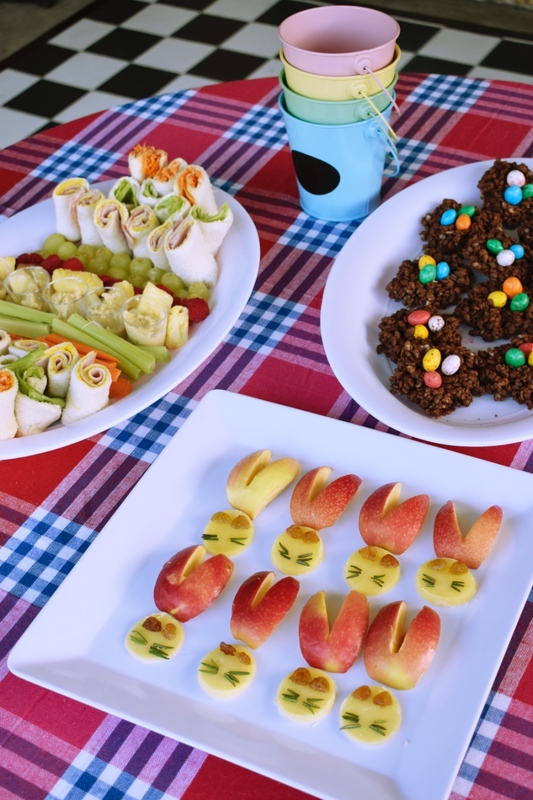 Grab an oval plate, and layer it with fruit, vegetables and sandwich rolls. 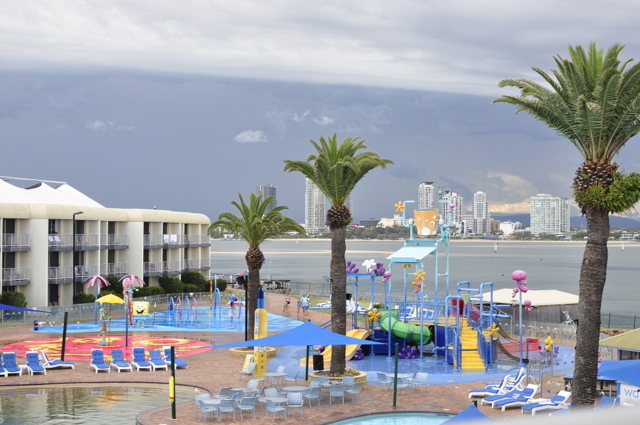 Think about using a pastel colour theme. For example, cream cheese & lettuce (green), cream cheese & grated carrot (orange), ham & mustard (pink and yellow). For the fruit, I used green grapes (cut in half), raspberries and pineapple. And veggies: carrot and celery. I also included individual servings of hummus to enjoy with the vegetables in little shot glasses. 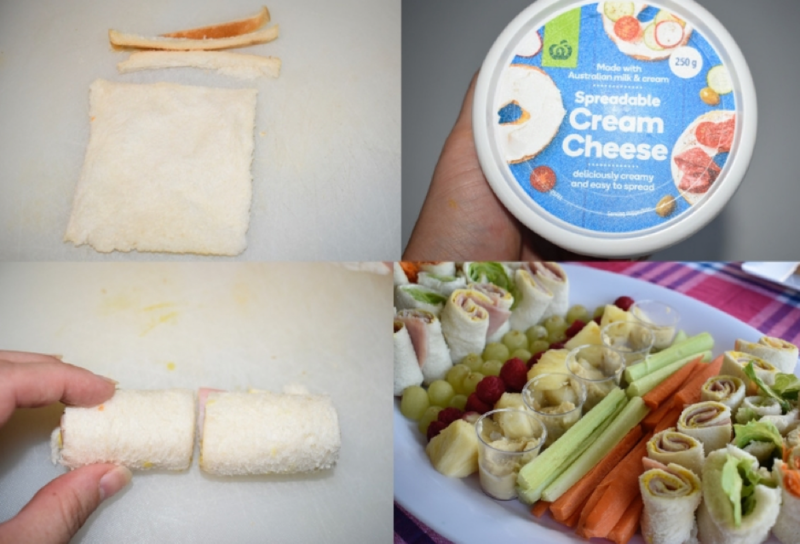 To make the sandwich rolls, trim the crusts off the bread, add toppings and roll it up. Then cut the roll in half before placing on the platter. 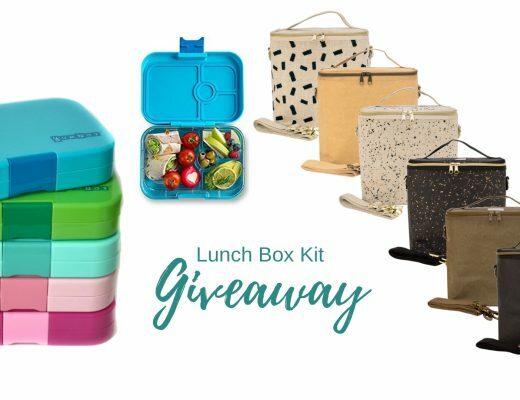 Kids love these bite-sized sandwiches. A twist on the Aussie classic. 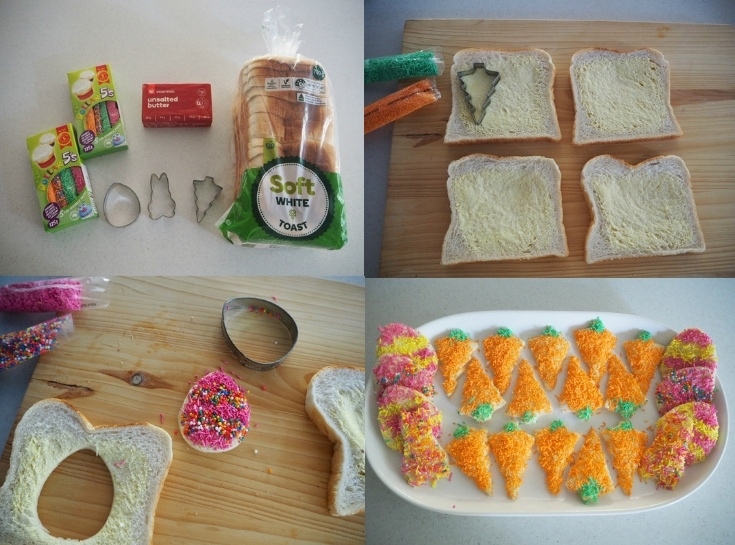 Use an egg cookie cutter and a Christmas tree (upside-down) for the carrot. If you want to make something really quick, there is very little you need to do for this dessert snack. 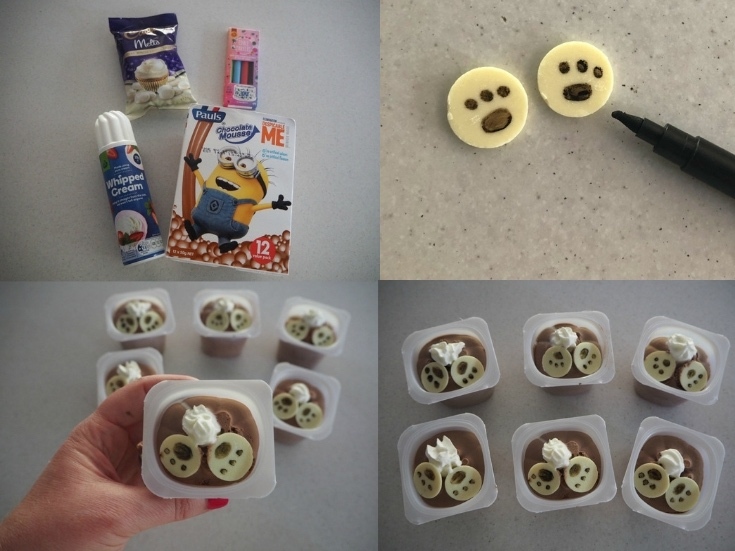 Draw a paw print on 2 chocolate melts. Place the melts in the custard or mousse for the feet. Add a squirt of cream or mini marshmallow for the tail. Done!